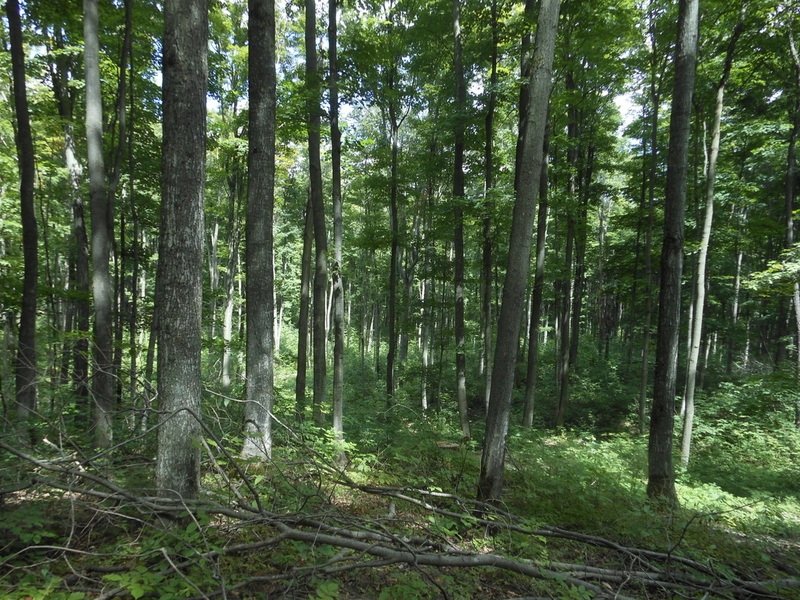 The Simpson Road Forest Area is 160 acres of mixed northern hardwood forest, pine plantations, and wetland. It consists of rolling terrain with a few steep slopes. Access to this acreage is from Simpson Road which borders the North side of the property. 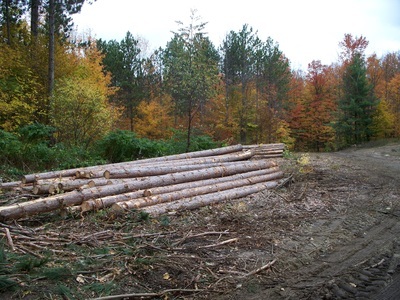 Logging type trails exist on the parcel and are frequently used by hunters, hikers, snowmobiles and other motorized vehicles. The Simpson Road forest is an actively managed forest where trees are periodically harvested for forest products, wildlife habitat, trail construction or maintenance, insect and disease control or a combination of all of these. These acreages have also been leased for oil and gas development. The goal of the County is to use its forest land to protect open space, to provide recreational opportunities, to demonstrate sustainable forest management activities and to generate revenues through forest management activities. Organized commercial forest management activities began in 1986 and have since generated $90,640.40 in revenues through the sale of forest products. The land remained in private ownership until 1940 when it was acquired by the State of Michigan due to delinquent taxes. 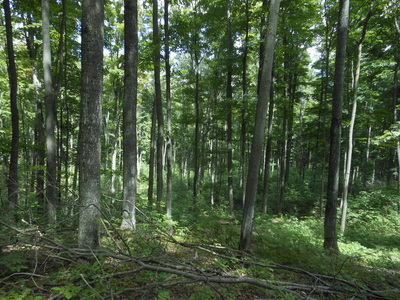 In 1950 the Department of Conservation for the State of Michigan granted the property to Antrim County under Act 217, PA 1931 to be used for forestry purposes. The State of Michigan retained all mineral rights thereon. In 1952 Antrim County granted a 100 foot easement across the parcel to Consumers Power Company for the construction of electric transmission lines. In 1997 Antrim County granted a pipeline right of way to Mercury Exploration Company for the construction of a 30 foot wide pipeline. In 2003, the MDEQ granted a drilling permit to Quicksilver resources for the construction of 1 well site and corresponding flow line on the parcel. The drilling sites were mutually agreed upon. The County was compensated $ 21,475.15 for surface damages including the removal of forest products. While the County is able to claim surface damages, all proceeds from gas produced from the parcel go to the State of Michigan who retained all mineral rights. In 1961 approximately 30 acres of open ground was planted to a mixture of red pine, white pine, jack pine and Austrian and Scotch pine. In 1968 an addition 20 acres were planted to red and Austrian pine. No records exist regarding lumbering prior to the 1960’s. In 1960, a diameter limit cut was conducted on the property. All trees 16 inches and larger were contracted to be cut. No records exist regarding volumes actually removed from the parcel. In 1986 the County hired Lee Ekstrom to conduct a pine tinning on the parcel. Approximately 252 cords of mixed red, white and jack pine were removed from the property. $ 2972.38 was generated from this sale. 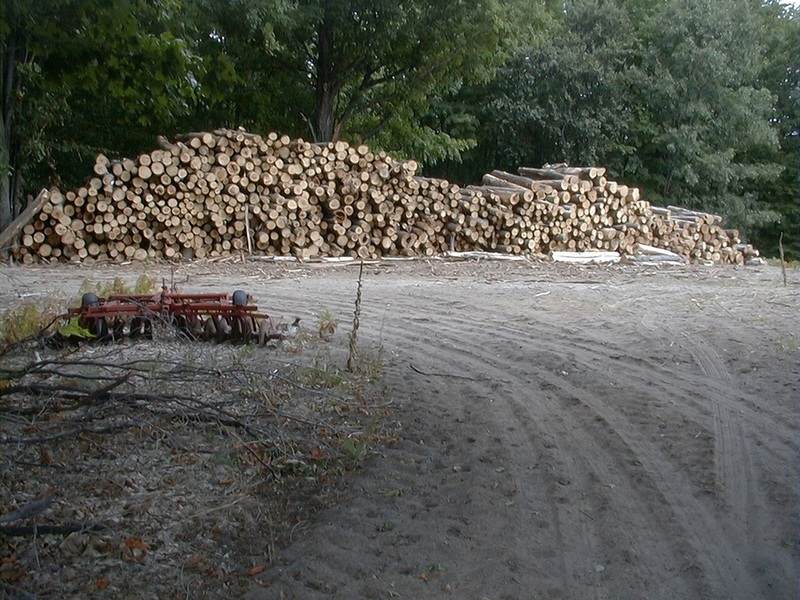 In 2000 the County conducted a competitive bid sale for the harvest of 21,000 board feet of mixed hardwood logs and 429 cords of hardwood pulp. Trees were selectively marked by the Antrim Conservation District forester. A lump sum price of $ 4650.00 offered by Ralph Hines was approved by the County Commissioners. 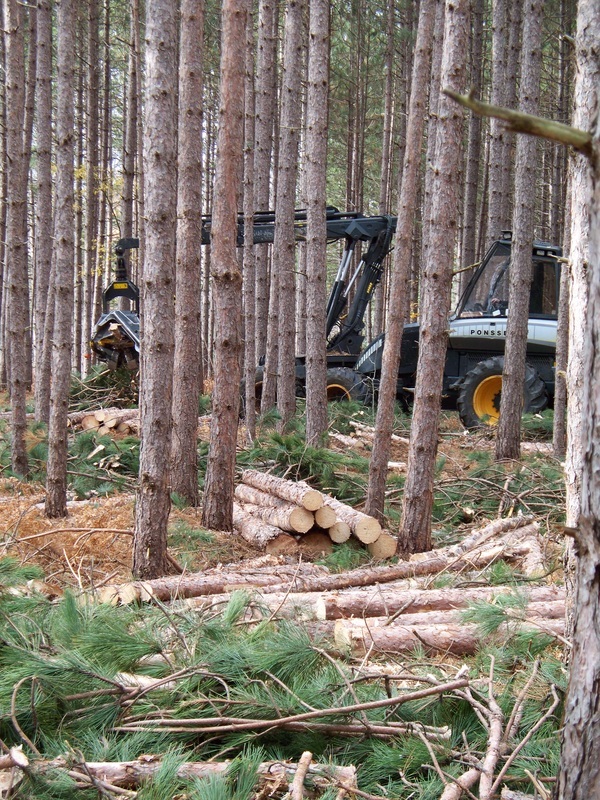 In 2001 the County conducted a competitive bid sale for the harvest of 212cords of mixed pine products. This sale focused on removal of diseased scotch and jack pine. 10 acres were clear-cut. A lump sum price of $ 8,500.00 was offered by Biewer Lumber and approved by the County Commissioners. 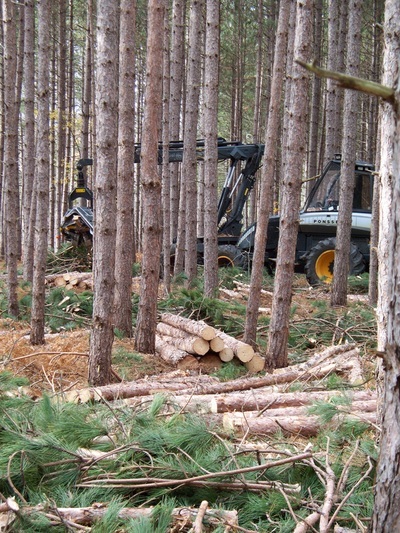 In 2008 the County conducted a competitive bid sale for the harvest of 500 cords of red pine products selected for harvest by the County Forester. A lump sum price of $ 29,118.87 offered by Biewer Lumber was approved by the County Commissioners. In 2013 the County conducted a competitive bid sale for the harvest of 561 trees selected for harvest by the County Forester. A lump sum bid price offered by Eklund Forestry of $23,924.00 was approved by the County Commissioners. 96,745 board feet of mixed hardwood products will be removed from the parcel in 2013. The bulk of this volume was white ash trees impacted by the emerald ash borer. The Antrim Conservation District has been responsible for developing management plans for County owned forest lands. These plans address the natural resources management on the individual parcels. They contain information on cover type descriptions, forestry statistics, historical information, wildlife recommendation, recreational usage, and educational opportunities. More recently some discussion on forest ecology has been added. Plans are written to address a 10 – 15 year planning period. The Simpson Road parcel has been divided into four (4) primary management units with a total acreage of 160 acres. 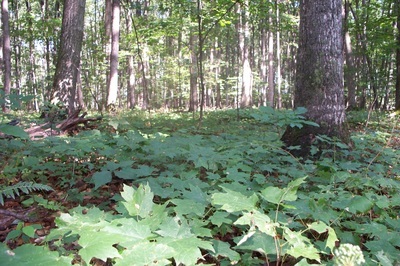 Unit 1 is approximately 80 acres in size and contains mostly northern hardwood species dominated by sugar maple. Red maple, black cherry, basswood, ash, aspen and beech are also components of this stand. This unit has received several treatments aimed at improving the sustainability of the forest resources. 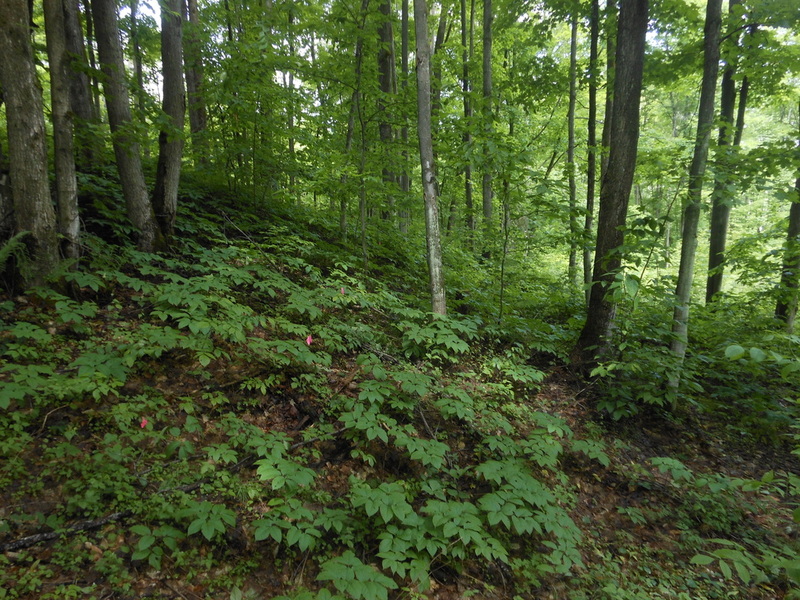 Management Unit 2 is 15 acres of relatively young northern hardwood forest. Scotch and jack pine were removed in 2001. Management Unit 3 is the pine plantations that were established on the property in the 1960’s. There are 52 +/- acres of primarily red and white pine. Management Unit 4 is a small wetland environment along Simpson Road. It is approximately 2 acres in size and jointly owned with the neighboring parcel. The remaining acreages (11 acres) are roads, trails, and power line and gas line easements. In 2011/12 Ash removal has become a priority on the parcel. 20 percent of the trees are white ash and susceptible to Emerald Ash Borer infestation. Rather than allowing these trees to simply decline and die from the insect, harvesting the ash has been recommended. Garbage dumping and wetland destruction from ORV’s have been increasing on the parcel. It has been recommended that the property be closed to vehicle traffic and ORV usage. This parcel has been used extensively by the public for 70 + years. Hunting and mushrooming likely are the highest user groups. Snowmobiling and summer time ORV users also frequent the parcel. As new roads and trails are created so has the use of ORV usage of the property. This parcel is heavily used during the firearm deer season. Hunting access is walk in only. Small game hunting such as turkey hunting, squirrel hunting and coyote hunting are also seasonal uses during those respective hunting seasons. A multitude of old logging tails, gas lines and foot trails exist within this unit. Maintaining existing roads and trail amplify recreational activities and are considered an asset to the parcel as a whole. Recreational activities have been increasing on this parcel. Commercial forest properties are capable of providing forest management education by example. Also available on this parcel is examples of oil and gas development. There have been no outdoor classes conducted on the parcel. This unit is close to the Bellaire and Mancelona Schools.